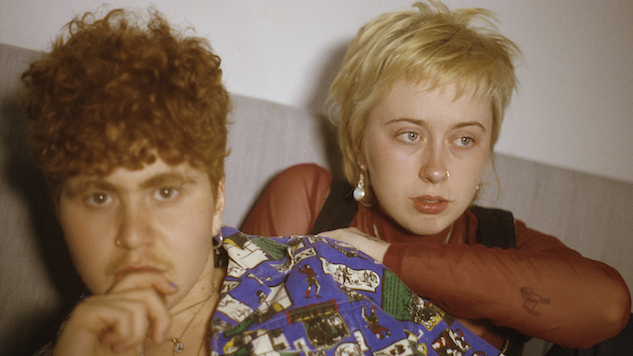 Girlpool Share New Track, "What Chaos Is Imaginary"
“What Chaos is Imaginary” opens with a moody organ before lyrics pour out freely like the somber, fragmentary inner-workings of someone experiencing an overwhelming onslaught of emotions. The track’s exquisite strings and sparse electronic percussion perfectly accent Harmony Tividad’s elegant cooing and Cleo Tucker’s soft, grizzly vocals. “What Chaos Is Imaginary” is a song very close to my heartmind … closer than most. I wrote it at the most vulnerable point I have ever had thus far in my life. I was living very far from ‘home’ and not taking the best care of myself on any level … no matter what I did, I was getting into situations that were emotionally, spiritually and physically putting me at some type of risk. These situations culminated in me having horrific PTSD (I didn’t realize it was this until long after) during which I found it completely impossible to imagine living beyond the time I was in. The ‘present moment’ was impossible to even begin to participate in. There was very nearly a white noise over all interactions and I couldn’t focus in any social situations unless I somehow found a way to be in my wrong mind. This song is about reckoning with this—trying to find a path to forgiving myself, attempts to redevelop a relationship with the world where I could find some illusion of ‘safety’ and belief in the fact that I could ultimately take care of myself. Girlpool will be on the road this spring to promote their new release and Hatchie will open for all of their dates. Listen to “What Chaos Is Imaginary” below, along with Girlpool’s 2017 Paste Studio session, and see their upcoming tour slate further down. You can preorder What Chaos Is Imaginary here and get the lowdown on everything we know about the album so far here.